Low-carbon heating is amongst the toughest challenges facing climate policy. Mike Hemsley, Senior Power Analyst at the Committee on Climate Change (CCC), summarises new insights on achieving near-zero emissions by 2050 from heating the UK’s buildings. 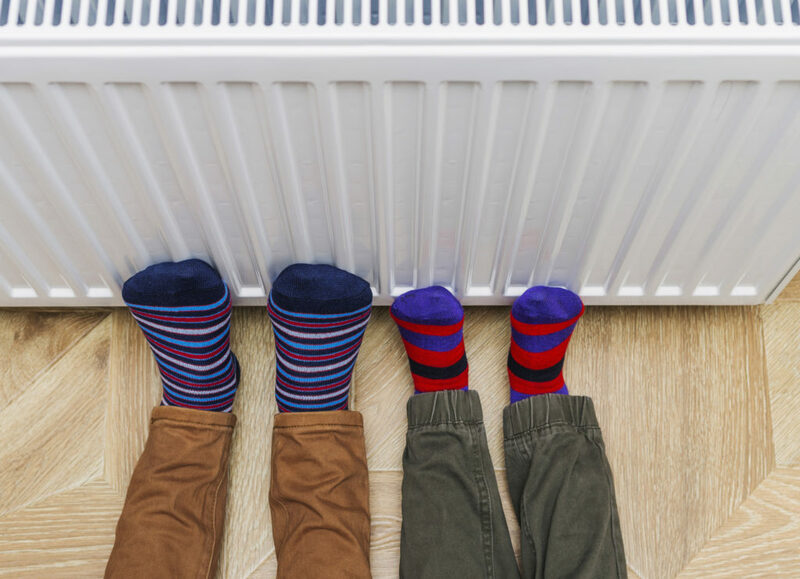 The ‘Beast from the East’ in March 2018 highlighted the challenge of heating UK homes during an extended cold period. Most of this heat was provided by natural gas through the UK’s natural gas networks, which – as a recent UKERC briefing notes – supplied an extra 120 GW of demand over a 3 hour period. This demand is equivalent to 15 million UK households turning their heating from zero to max over three hours, all at the same time. How will we stay warm as the UK moves away from natural gas and towards low-carbon systems such as heat pumps or hydrogen? The CCC has continually identified the need to reduce emissions from the UK’s buildings – which made up 19% of the UK’s overall emissions in 2017 – in order to meet its decarbonisation targets. This means a combination of making existing and new properties more energy efficient, and finding a low-carbon heat source for 85% of UK households that currently use fossil-fuel based natural gas. These households currently emit around 2tCO2 per household per year – roughly equivalent to a return flight to Argentina – which represents around one tenth of the average UK household’s carbon footprint. The CCC recently set out its view on alternative pathways for decarbonising heating in its 2016 report, Next Steps for UK Heat Policy. A number of ‘low-regrets’ approaches feature consistently across the different pathways: energy efficiency across UK building stock, low-carbon heat networks in heat dense areas, low-carbon new buildings, and biomethane injection into the gas-grid. However, this leaves over 20 million gas-heated homes in areas where heat networks are not cost-effective. For these homes, alternative options are needed which might include electrification using highly-efficient heat pumps together with new generation storage heaters in smaller properties; ‘greening’ the gas supply (e.g. shifting to low-carbon hydrogen), or a combination. Hybrid heat pump solutions may also help, in which the bulk of heat demand is met by electricity, and peak demand met by hydrogen, biomethane or some natural gas. Recently, the CCC commissioned Imperial College London to explore the challenges around on-gas homes, in particular investigating how low-carbon energy systems could deal with ‘Beast from the East’-style events. There is no ‘silver bullet’ solution to decarbonising heat. The costs for hydrogen, heat pumps, and hybrid heat pump decarbonisation pathways, are broadly similar across a range of emissions constraints. Hybrid heat pumps are marginally lower cost, against a range of assumptions. This could see up to 85% of a consumer’s heat demand being met by low-carbon electricity, with the remainder being provided by natural gas, biogas or low-carbon hydrogen. Balancing energy supply and demand is easier when considering both the UK’s electricity and gas networks in tandem, rather than in isolation. Future thinking on energy transitions should reflect this. Improved energy efficiency, lowering costs to households and businesses, and flexible electricity demand, can deliver big cost savings in a transition to low-carbon heat. The finding that overall system costs are similar regardless of the heat decarbonisation pathway is in contrast to previous findings in a 2016 KPMG report, but is in line with more recent work by Element Energy and E4Tech for the National Infrastructure Commission. These costs are also in line with our previous assessments of the costs of meeting carbon budgets. The 2016 study by KPMG suggests that the cost of electrifying heat could be up to three times the cost of a gas-based pathway. The biggest differences between the two studies is likely due to the falling cost of renewables (see our 2018 Progress Report to Parliament for further discussion of this), and the costs and capacities assumed for heat pumps in domestic premises. Imperial College’s results are similar to findings by Element Energy and E4Tech, which suggest annual costs of hydrogen, heat pump, and hybrid gas-electric, are within 10% of each other. These costs are included within our previous estimates of the total costs of meeting carbon budgets (less than 1% of GDP). Although, important questions remain around who pays and how to help reduce the cost to consumers. The challenges of decarbonising the UK’s heating supply is becoming increasingly evident. However, there is a growing body of evidence providing insights into how best to manage the low-carbon transition of heating systems in order to meet the UK’s legally-binding 2050 climate change targets. These studies above are a part of a larger volume of research in this area, including the ongoing Freedom project hybrid heat pump trials, the H21 project, research by the Government’s Department for Business, Energy and Industrial Strategy (BEIS) on low-cost solid wall insulation, and the Government’s heat strategic options publication (due imminently). The CCC plans to review the implications of these findings in our 2018 report on hydrogen, due to be published this November, as well as our future work on the sixth carbon budget, due in 2020.